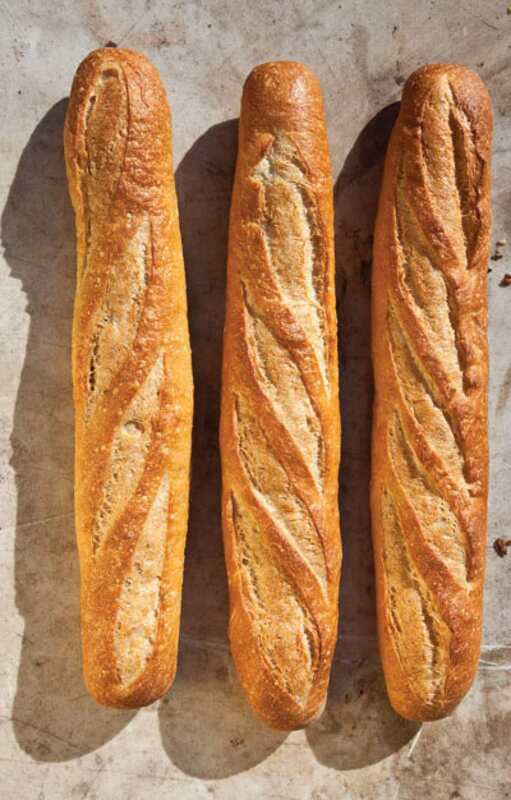 This amazing baguette recipe doesn't need any fancy ingredients! The all-purpose flour that's already in your pantry is better than bread flour for the authentic Parisian crumb and crispy crust. Baguettes are also called stangenbrot and used in German fast food such as Brötchen, or next to a warm stew like Metzelsuppe or oxtail soup. They are also a typical base for crostini, as well as being wonderful dunked in a bowl of coffee, French- style. While all-purpose flour is called for in this recipe, you can also substitute specialty flours, such as European-style or Italian-style flours, which are all a bit lower in protein than bread flour, affecting the final crumb and crust. Pay attention to how you measure the flour. Flour spooned lightly into the cup, then smoothed off weighs about 120 grams per cup. If you dip your cup into the sack, you pack it down and only 3 1/2 cups (or even a little less) will be needed. Use a scale for the most precise measurement. Remember, it's the consistency of the dough that is important, not the exact weight or measure of the flour. Depending on the humidity and how dry the flour is, you will need to adjust the final dough by adding a bit more flour or working in some water with wet hands. Chlorine in the water can affect the taste, and sourdough organisms are sensitive to it. Although there is no sourdough in this baguette dough, I have a habit of using bottled water or tap water which has stood overnight on the counter to release its chlorine, just to have the best results I can. Charcoal and other water filters can also remove chlorine. You can still use untreated tap water if you like its taste. Pour the water into a bowl. (Use the stand-mixer bowl if you want to knead it in the machine.) Add the yeast (instant or bread machine yeast dissolves quickly, but regular, freeze-dried yeast may be used), salt, and enough flour to make a shaggy mass when stirred with a spoon. Let the flour and water mixture sit for 20 to 30 minutes to rehydrate. Place the bowl on the mixer with a dough hook and mix on low speed for 8 to 10 minutes. Turn dough out onto a lightly floured board and knead a few times with your hands until smooth and springy. The dough should be a little sticky (wetter) rather than too dry, so try not to add too much flour. If you are mixing by hand, turn the rehydrated mixture onto a floured board and mix until the dough comes together in a ball, about 2 minutes. Knead for 10 to 12 minutes total. The dough should err on the slightly sticky side. The wetter the dough, the lighter the crumb. Place the dough in a lightly oiled bowl or another container. You may wish to mark your beginning dough height on the container so you can tell how far it has risen. Cover so the dough does not dry out. Let it rise at room temperature (about 75 F or 22 C) for 45 minutes, or until dough has risen 25 to 50 percent from original (not doubled). If your house is cooler, as mine frequently is, this may take an hour or more. Lightly dust the counter and turn the dough onto it. Pat it gently into a rectangle and fold it, brushing off excess flour as you go. Fold it letter-style, then make a quarter turn and fold letter-style again to form a square ball. Place it back into its container, cover and let rise to 1 1/2 times its size (not quite doubled), 45 minutes or more. Lightly dust the counter again and turn the dough out onto it. Do not pat it down as before, but cut it with a knife or bench scraper into three equal pieces. The pieces should weigh about 10 ounces (285 grams) each. Pat each piece into a rectangle, brush off excess flour and fold the long edge towards you. Press to seal. Fold again, to create surface tension around the torpedo-shaped dough. Seal the seam by pinching. Place both hands on the center of the dough and rock the baguette back and forth while applying slight pressure out towards the ends. Do this a couple of times until the baguette is about 15 inches long. Make sure the seam is well sealed, then place the baguette on a lightly-floured (or cornmeal, if you prefer) piece of parchment paper laid on the back of a cookie sheet. Prepare the other two loaves the same way. Place the loaves as far apart on the parchment paper as practical. When the loaves are done, pinch and lift the parchment paper, accordion-style, bringing the leaves close together. Dust the tops with flour and cover lightly with plastic wrap. Turn on oven to 450 F. Place an old pan on the bottom rack to heat and adjust the top rack 1/2 way up. If you have a bread stone, heat it with the oven. Let the loaves rise for 30 to 40 minutes, or until they have increased in size by about 50%. Slash the top of the baguettes with a lamé, a razor blade, or even a serrated bread knife. The cuts should be at an acute angle to the length of the loaf and parallel to each other. If the dough well rises, the cuts spring open almost immediately to show the inside of the loaf. Slide the loaves with the parchment paper into the oven. If you have a baking stone, slide them off the cookie sheet directly onto the stone. Otherwise, keep them on the upturned cookie sheet. Pour some hot water from the tea kettle into the old pan in the bottom of the oven. Close the oven door. If you like to spray the oven walls, do it within the first 5 or 10 minutes of baking. Bake the loaves until they are golden brown, about 15 to 30 minutes (depending on elevation). Turn the loaves about half-way through and remove the parchment paper if it is getting too brown and crispy. Remove the bread from the oven and cool on a wire rack for good air circulation. Eat within 4 hours of baking for best taste, or wrap in plastic foil and freeze for up to three months.